Optima, as all models of the Fastbind’s new generation of binders, offers the largest flexibility. 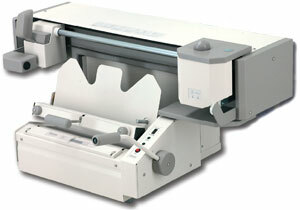 This semi-automatic perfect binding machine quickly produces books with hard or soft covers, tapes, etc. It is ideal for print/copy shops, publishers, binderies, school yearbooks and photographers. The end result is a strong, square and affordable perfect bound document. The Perfect Binder RBS-Optima features an automatized glue application, which ensures even and constant binding results for on-demand or medium runs of book production and allows a “stand-by” temperature selection. 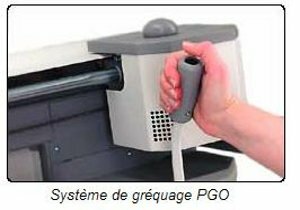 The Perfect Binder RBS-Optima includes the exclusive “PGO” Paper Grain Opening system. 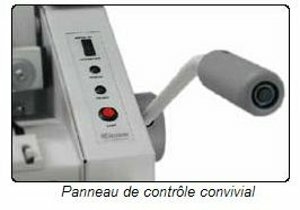 This noiseless and dust-free roughening unit makes the machine suitable for handling the most difficult papers. The operator can control the number of PGO passes that need to be made to ensure a solid bind. The system self adjusts automatically to different thicknesses and page formats, allowing non-stop production between different binding jobs. There are no set-up times or book format adjustments. Anyone can be making professional quality books and reports in minutes. The optional hardcover toolkit consists of a hardcover nipping bar and a special paper guide. 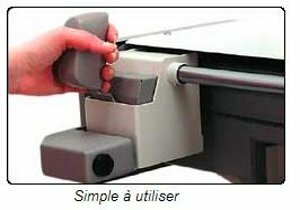 It allows you to bind hard cover books with your Perfect Binder Optima machine. The special shape of the bar gives professional look to the finished book. The thermal binding cover with slipcase, what is it? The “stuck square back” is an universal binding system, the device prepares and diffuses the glue and fits the cover into the warm glue. To bind a pad, an accounting balance, one poem, a catalog, a textbook, a price-list, an history, a document of training, a tool for conferences, a detachable block, ... it’s possible. A professional image towards your customers! It allows you to change or update your documentation quickly and easily. Provides strength without loss of material. You've got a flat opening documents without punching holes or staples. Your catalogs will be highlighted! They will be durable and neated. Your binding is solid and durable, so you can manipulate your document as many times without damaging its holding. To bind brings you a great looking finish and minimizes your wasting. We recommend with the models Secura, Elite, XT elite and Optima, casing covers with the rainage. CopyLux Series marbled 200gsm Casing covers.